Our glorious spring weather has temporarily disappeared and the reality of February in CT has returned. What a perfect excuse to gather together with like-minded garden lovers and talk plants! You will have many opportunities to do so in the coming weeks, starting with this Saturday when I will be teaching two inspirational workshops. The first is all about The Healing Power of Plants. Open up your heart to the reason that we all really love gardening. This is a perfect way to celebrate Valentine’s Day weekend. The afternoon workshop is all about Growing the Healing Herbs. I weave herbs into all of my gardens and into every aspect of my life. You can too. We have a lot of people already signed up, but walk-ins are always welcome. All of the details are below and on our website. 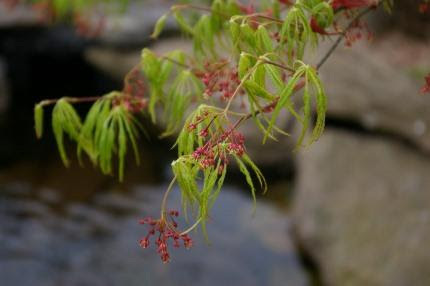 newly born Japanese maple flowers and leaves emerging in the spring. I sit on the edge of this garden and try and spot my frog to center myself when I get home from work each evening. 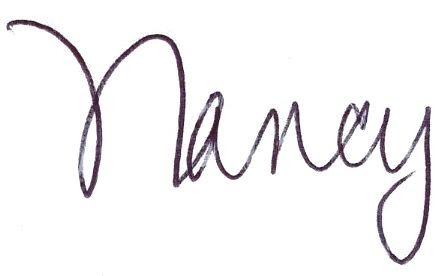 Winter is the ideal time to dream about the changes you are going to make in 2016. My hopes for the growing season ahead are many. I want to grow even more food than before. My husband and I just finished up the last of our frozen blueberries and peaches. What a winter treat they are, and SO needed right now. I wish I had enough for another two months. It’s not because I didn’t harvest enough, I just didn’t freeze enough! All you have to do is spread them out on a cookie sheet, place them in the freezer for a few hours, then pour them into freezer bags. Too easy. The peaches were frozen in a simple syrup of honey and lemon basil. See what I mean? Herbs can be woven into everything! 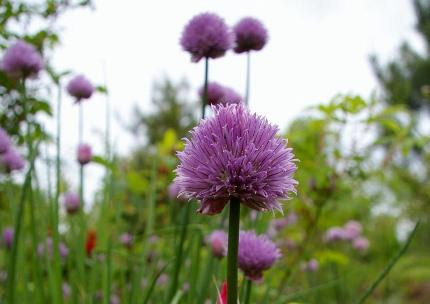 Chives are one of the easiest perennial herbs to grow. The flowers are edible and the plants look great edging a garden. exciting day! Seeds are being reordered today, and the racks will be wrapped up and loaded into our vans next Mondaymorning for their annual trip up to the CT Flower and Garden Show in Hartford which starts a week from Thursday. THAT is what my staff is placing a laser beam focus on right now, preparing and packing for the show. I will be holed up in my home office as I am giving two talks at the flower show. The first is on monarch butterflies. The second is on growing as much food as possible in your yard. 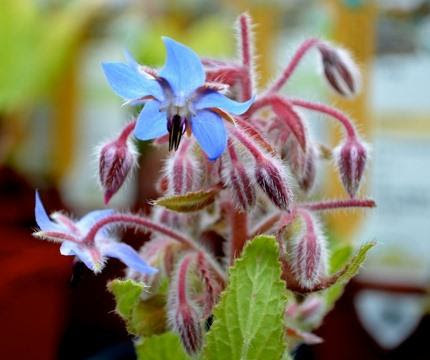 Did you know that borage has edible flowers? It is also a healing herb as well as an important plant for pollinators. Learn all about how easy it is to grow inthis Saturday’s workshop. hummingbirds, and… you! It will be a series of 6 mini-classes, each 3/4 hour long, with lots of great handouts and books for sale. Click here to go directly to our website where you can see the entire class lineup and even register for classes on line. Along with preparing for classes, I am thrilled to haveseven landscape design projects during the winter months. Working at home on my drawing board while watching the birds at the feeder outside of my window is a pretty nice job description, wouldn’t you say? Designing and teaching go hand in hand, and both help me to improve my plant knowledge as well as hone my skills. This is my 33rd year of this rewarding winter work. Buried beneath all the snow lie our hopes and dreams for all of the flowers, herbs, fruits, and vegetables that we will grow and enjoy until the snow returns next December. Take advantage of this indoor time and study up on some new ways to enhance your surroundings. I have been deeply engrossed in studying many books, including Attracting Native Pollinators and three books on the European design style of Piet Oudolf. 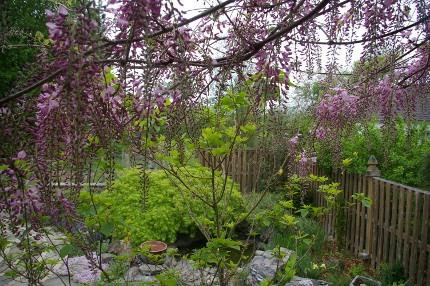 After visiting The High Line in New York City last summer, I was convinced that landscaping with broad masses of native grasses, bold perennials, and select flowering trees and shrubs is exactly what I aspire to in my own yard. With nearly a quarter of an acre of newly cleared land (the hillside formerly know as my bittersweet nightmare), I have the perfect opportunity to paint my property with the same bold strokes. Stay tuned, this is a ten year project in its infancy! The view from my deck in May. I hope to see you this Saturday, and then at the flower show in Hartford after that. Grab a gang of like-minded gardening friends, or perhaps introduce some of your friends to the magic of gardening, and you will melt away the winter blues. I guarantee it!